Multiplicity is becoming one of the big ideas of our times, as the notion that our reality is a holographic multiverse has recently gained significant support from a number of different scientific findings. 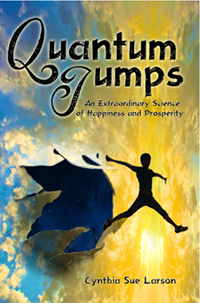 The idea that we exist in an interconnected multitude of parallel realities is one I describe in detail in my new book, Quantum Jumps, which explains how to move from one reality to another. The more open we are to seeing our lives as being the stories we tell ourselves and one another about who we are, the easier it can be to become kinder, stronger, smarter, more resilient, more confident, and healthier. There are lots of ways we can take some baby jumps in these directions, and lots more ways to enjoy life when we do! An ancient technique of name healing which has been practiced in China for thousands of years, and is still being practiced today is described in Quantum Jumps. A description of this practice is based on the wonderful research of authors Gary Lee and Nicholoas Tapp in their study of the Hmong. The concept of name healing is based in the idea that when an infant or young child becomes dangerously sick or ill, there is a chance that by renaming the child, he or she can become well again. From a quantum jumping point of view, you might say that the entire family and village join in re-envisioning the young person as someone fresh and new–as someone who is perfectly healthy and well. In my life so far, I have made big transitions that included name and appearance changes. The first was in the 1980s when I got married, cut my hair short and wore business suits that consisted of jacket, skirt, blouse and silk bow tie. This was the perfect look for business, and with this combination of my new married name and a whole new business wardrobe, I felt like the Fortune 500 MBA project manager I considered myself to be. Something I learned when moving to Lausanne, Switzerland when I was a new mother in the 1990s was that one of the best things about new beginnings is the opportunity to reinvent myself and enjoy a completely fresh start. I had been employed in the corporate world for the past seven years before making this big move, and I was overjoyed to discover that in a whole new city, canton, and country it really is possible to reinvent oneself. I had so much fun dressing like a European, shopping and traveling without a car, and thinking differently in ways both large and small. Wearing a minidress was considered perfectly respectable, and enjoyed a sense of freedom to show the world a whole new side of me that I had never previously been able to feel comfortable sharing before. I made my third big name and appearance change in the 2000s, after my daughters were born and after I got divorced, when my literary agent encouraged me to change my name from “Cindy Sue.” My literary agent pointed out my name had just a bit too much of a hillbilly sound to it, as she asked imploringly, “Are you known by any other name?” She was relieved to hear that my name is “Cynthia Sue,” and that is the name accompanying this up-and-coming author, as I grew my hair out and started wearing long batik dresses when not wearing jeans. Yet another name and appearance transformation I’ve enjoyed over the past fifteen years is involved with practicing martial arts, which comes with rank, title and a uniform. Engaging in martial arts provides me with benefits from yet another facet of my total self. Much of the joy I feel when making transformative changes at times of life transition comes from the fun of getting to be and do something different that I truly wish to experience. I wanted to be a business manager, a stay-at-home mom, an author, a martial artist, and I became all these things. I have come to realize that each of us is capable of doing a great deal more than we typically realize, and sometimes all we need to get started is taking the first few steps. As a spiritual life coach, I especially enjoy helping people treasure these kinds of transformative changes in their lives! I was just interviewed by Lilou Macé in my garden for her Juicy Living Tour, which was a truly delightful experience. To prepare for her arrival at my home, I’d cleaned and dusted my living room book shelves, thinking Lilou might wish to gaze upon some of the books I love and cherish… but when Lilou and her assistant arrived, the morning sunshine and our canine backyard ambassador beckoned, so we filmed our conversation in the garden. I’m a big fan of Lilou Macé’s, ever since finding her wonderful interviews of best-selling author Dr. Larry Dossey on YouTube. I love Lilou’s interviews with Dr. Dossey and his beautiful wife Barbara Dossey, because they capture the best sense of who they are as human beings, and what his passions and interests are. I was thoroughly charmed by the tour of their book shelves, showing a Tibetan labyrinth meditation, and a great way to relax when traveling… with needlepoint! As it turns out, one of the interviews I love best of all–the Dossey home tour in which Lilou walked around Dr. Dossey’s home and talked with Larry and Barbara about books on their book shelves, Dr. Dossey’s service years in Vietnam, oriental dragons, and treasures from their travels–was one of the first Juicy Living interviews Lilou ever did! I loved the effortless way she raised interesting topics for discussion with Larry and Barbara Dossey, and the way the conversation flowed so naturally. I truly felt like it was the next best thing to being there, and felt totally at home. This, to me, is what makes Lilou’s Juicy Living Tour such a delight and joy to watch–that feeling that you’re right there with her, enjoying fascinating heartfelt conversations with good friends. Lilou and I talked about energy, fearlessness, love, meditation, near death experiences, time shifting, reality shifts, and what’s involved in shifting gears energetically to achieve a higher vibrational state that accesses a parallel universe reality you’d like to experience. Lilou Macé asked me specifically about time shifting, which is an interesting variety of reality shifting. One of the ways most people experience time shifting is when they find they’ve gone very far in a short amount of time. Lilou pointed out it would be nice to be able to control this ability, and have access to it when one wishes. We also talked about bilocation, and the way sometimes people are seen in more than one place at the same time. This has happened to me on a couple of occasions when I was daydreaming that I was exactly where people later told me they’d observed me to be. The best way I know to help ensure these positive types of reality shifts occur more frequently is to meditate more often. I told Lilou Macé that meditation is something we can do that takes us to no-when–the place where all time is accessible–the place that near death experiencers like Anita Moorjani describe having visited. Meditation can act a lot like putting our foot on the clutch pedal of a stick-shift car, which serves to disengage the gears (this reality), allowing us to move up to another parallel universe (another reality). When we combine favorite relaxation activities with favorite ways to focus our attention, we see there are many types of meditation open to us. Gardening, doing dishes… and even doing interviews can be forms of meditation! We talked about how at this time when physicists have found what appears to be the Higgs Boson through experiments at the Large Hadron Collider, the Holographic Multiverse Interpretation of quantum physics appears to now be the leading explanation for how reality works. According to this interpretation, we exist in a multiverse of parallel universes with many possible you’s and many possible me’s. We can experience new realities when we bridge the gap between two universes of possibility, and such bridging happens naturally when we access a “no-when” state of mind. I talked with Lilou Macé about my favorite question, “How good can it get? 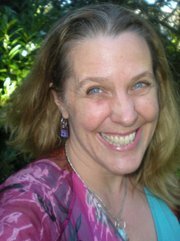 !” and the way it serves to access fresh new imaginative ideas and inspiration that the universe can then share with you! Near the end of my video interview with Lilou, we both shared our mutual adoration and respect for best-selling author and inspirational visionary, Dr. Larry Dossey! Here is a link to my interview with Lilou, followed by her video from her visit to the Dossey home. Enjoy!